Fourteen farming organisations, including NFYFC, have issued a joint statement on UK Government to provide short-term certainty for the industry as exiting the European Union and the Common Agricultural Policy draws closer. The 14 organisations say Governments across the UK need to work together with the farmers and land managers to prepare for a new long-standing free trade agreement which retains and grows opportunities for food trade with the EU and the rest of the world. They also call for commitments on transition that will see the UK remain in the Customs Union until a full free trade agreement is in place with the EU. Deputy President Tim Breitmeyer said: “Farmers and land managers will benefit from new opportunities in trade and agricultural policy. However, we must take the necessary time to put in place the right trade agreements and to develop and robustly test a new policy that will support farming and the environment for the long-term. “We need a period of certainty in which this work can be done and we will continue to work with fellow farming organisations to achieve this." Young Farmers in Devon have launched a new safety campaign to encourage the farming community to wear a seatbelt when they are driving a tractor. The campaign, called #buckleupforiceman, was launched after the tragic death of YFC member Todd Riggs who was killed in a trailer incident in the week leading up to Farm Safety Week. Todd’s nickname was Iceman. Gemma Smale-Rowland, Todd’s friend, helped to launch the campaign and said: “We’ll never know if a seatbelt would have saved Todd’s life but it has certainly made people think about wearing one. The challenge asks people to nominate friends and family to ‘buckle up’, take a photo or video, share on social media and tag at least two more people to do the same. The campaigners are also getting stickers printed to stick on tractor doors and windows with the #buckleupforiceman hashtag. Thanks to online pledges from YFCs and County Federations, during Farm Safety Week in July, thousands of members will receive life-saving farm safety training. 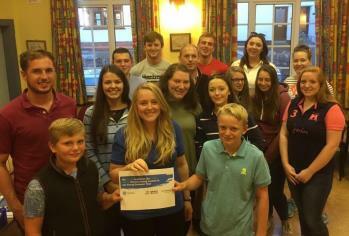 NFYFC asked its 624 clubs to ‘pledge’ their commitment to putting the training on their Club Programmes during the 2017-18 membership year. Members took to social media to show their support by posting NFYFC’s pledge cards on their social media sites and registering their interest in the course on the booking form. Culm Valley YFC (pictured) was one of the clubs to post a pledge online and tweeted: "#TeamCV are making the pledge to deliver the farm safety Curve training as part of #FarmSafetyWeek!" So far, only 173 YFC members have received the training in their club but thanks to the surge of interest in the course during Farm Safety Week it is hoped more members will be reached. Farming continues to have one of the poorest safety records of any occupation in the UK and Ireland. The latest annual figures from the Health and Safety Executive show that out of 137 people killed or fatally injured in workplace accidents last year, 27 worked in agriculture. YFCs and members also supported the week by sharing materials from Yellow Wellies and using the hashtag #FarmSafetyWeek. 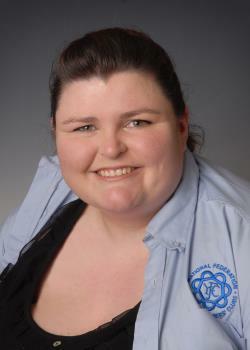 The Farm Safety Foundation’s message for the week was farm safety – it’s a lifestyle not a slogan. If you would like more information about the Farm Safety training module and to run the session in your club please visit the Farm Safety Week page. Applications for the The Food & Farming Industry Awards, are now open and young farmers can fill out an entry form for a chance to be recognised. 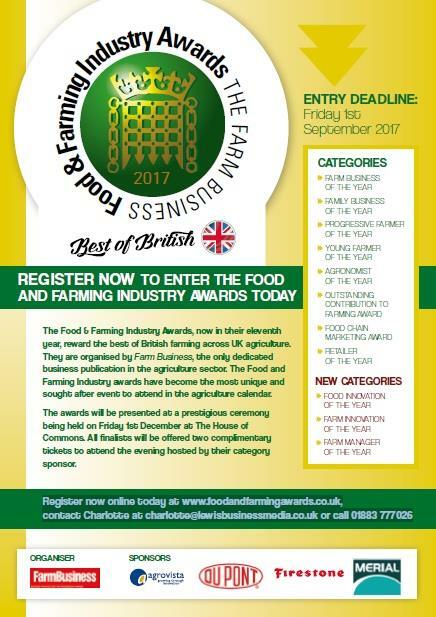 Now in their 11th year, the awards, organised by Farm Business, reward the best of British farming across UK agriculture. These awards bring together like-minded individuals who either have their own farms/businesses or work for other people and who all have the same drive and determination to succeed. The awards event gives everyone the opportunity to share ideas, at the same time as being recognised for their great achievements in relation to farming and business. The Food and Farming Industry awards have become the most unique and sought after event to attend in the agriculture calendar. The awards will be presented at a prestigious ceremony being held on Friday 1 December at The House of Commons. All finalists will be offered two complimentary tickets to attend the evening hosted by their category sponsor. Register online today at www.foodandfarmingawards.co.uk or contact Charlotte or call 01883 777026. Young Farmers are invited to apply for the RABDF's new Entrepreneurs in Dairying course. The course provides the neccessary training and coaching in specialist areas for individuals who want to move up the dairy career ladder. 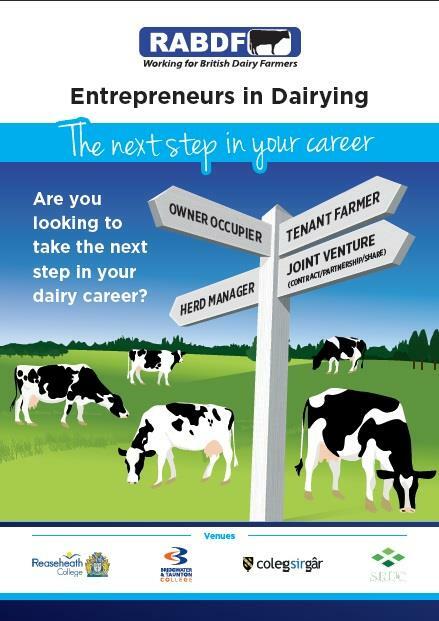 The course includes information on contracts, joint ventures, finance and presenting your business case and ultimately helps you plan the future of your dairy business. The application deadline for the course is the end of August and forms are available from the RABDF website.